Where do I use my Blinds Hut voucher code? You can discover a huge array of blinds at Blinds Hut including blackout roller blinds, blackout vertical blinds and blackout roman blinds in beige, black, blue, cream, green, orange, pink, purple, red and white. You can also discover roller blinds in all these colours as well as blackout roller blinds, greek roller blinds, children’s roller blinds and roller blinds in multiple patterns including plain, floral, striped, geometric, semi-plain, printed and football. If it’s roman blinds or vertical blinds you’re looking for you can discover an array of these in various colours and patterns too. Blinds Hut also provides Venetian blinds on their website. Shop by colour to find Venetian blinds in black, blue, cream, green, grey, orange, pink, silver, white and yellow. Shop by style and you can also find wooden Venetian blinds, 25mm and 50mm blinds, dark wood, gloss finish, light wooden, medium wooden, perforated finish and satin finish Venetian blinds. As well as providing an array of top quality blinds, Blinds Hut also offers help and advice in the form of buying guides and blog posts. Discover buying guides on roller blinds, roman blinds, Venetian blinds and vertical blinds, you can also browse through some of the most popular guides including ‘blind safety: keeping toddlers safe’, ‘fitting information for all blinds’, ‘which blinds are right for me?’, ‘the benefits of blinds’, ‘how to measure windows for blinds’, ‘considerations for blackout blinds’, ‘choosing blinds on a budget’ and ‘what style of blind to go for.’ You can also discover a handy blog in the help and advice section too which provides even more information on blinds, their benefits and their features. If you’re looking to keep the morning light from glaring through your windows, or if you work shifts and need your room to be dark enough to sleep at all hours of the day, then choose blackout blinds. Available in a wide range of colours that are sure to fit almost any palette, blackout blinds are not only practical and useful, they’re also attractive too; sure to offer a demure and sophisticated look to any window. Many of the blackout blinds available at Blinds Hut are not only good for areas where you want more protection from light, but also damp or humid areas since many are made of moisture resistant material. There are all sorts of blackout blinds available at Blinds Hut including blackout roller blinds, blackout vertical blinds and blackout roman blinds, all of which are made with the highest quality and provided at an affordable price. Roller blinds are one of the most popular types of blinds available on the market mainly due to their easy to use features, unrivalled flexibility and elegant look. You'll love the wide selection of made to measure roller blinds available at Blinds Hut. Not only do Blinds Hut have blinds that fit any room in your home, from the bathroom to the living room, it also offers a huge collection of different coloured blinds in various fabrics and patterns. Blinds Hut carries roller blinds in colours that’ll fit almost any decor, from neutral tones to vivid bold primary colours and soft pastels too. All of the roller blinds included in their online range are discounted and highly affordable, allowing you to fit them in every room in your house without spending a fortune. Find more delivery information here. To arrange a return please contact Blinds Hut customer services. Blinds Hut is one of the top online retailers of affordable blinds for the home. In their online repertoire Blinds Hut provide a variety of differently styled blinds including blackout blinds, roller blinds, roman blinds, Venetian blinds and vertical blinds, all of which come in an array of different colours and various patterns. 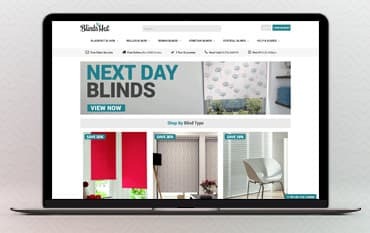 Majority of the blinds on offer at Blinds Hut are heavily discounted, and if you shop online with a Blinds Hut discount code from us, you can save even more on your order too. You can also benefit from free fabric samples, a 3-year guarantee and plenty of buying guides on all the products available.